Join us for this Online Advent Retreat! The Pray More Advent Retreat will be available on Sunday! 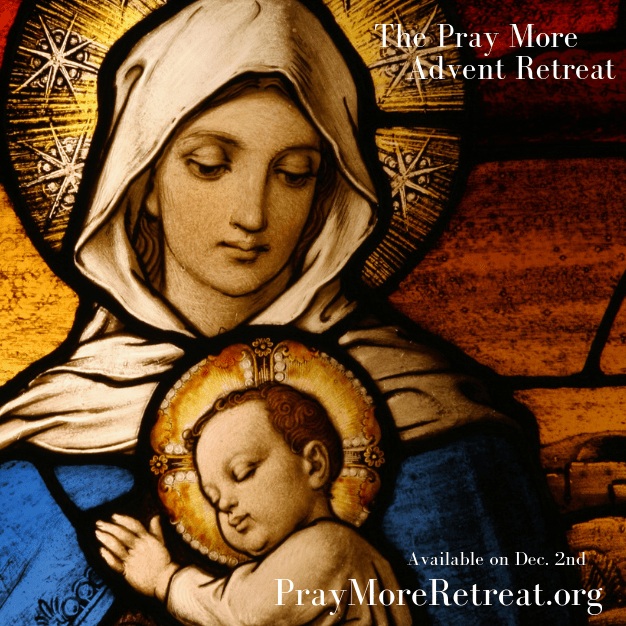 The Pray More Retreat is an online retreat to help you spend more time in prayer this Advent to prepare to celebrate the birth of our Lord, Jesus Christ. That’s why the retreat is self-paced; that means you can watch, listen or read the presentations whenever you have the time to do it. We hope the Pray More Retreat will help you intentionally work on your prayer life this Advent — wherever you are, and whenever you have the time. The talks are focused on prayer, the Advent & Christmas seasons, and lessons we can learn from some of the most popular saints. + Advent: What Are We Waiting For? Each talk was inspired by Mass readings throughout Advent. We hope the retreat will help you to slow down during this Advent season and truly prepare to celebrate the coming of Jesus Christ at Christmas. All of the materials will be released on Sunday, December 2nd. Dear Immaculate Mary, please heal our son of his depression and anxiety. Please help him to choose friends of strong Catholic values. Please also heal him of allergies and asthma. Thank you Blessed Mother and Jesus.